More patients are being diagnosed with sepsis than ever before, perhaps due in part to the efforts to raise sepsis awareness among both the general public and healthcare professionals. According to a study published in 2017, there are an estimated 1.7 million cases of sepsis a year in the U.S. Despite that high number, the overall mortality rate for sepsis in the hospital has dropped. (1) In addition, stays in the intensive care unit (ICU) for sepsis are about a day shorter than before. (2) However, while these survivors are going home more quickly and in higher numbers, many are finding themselves back in the hospital for illnesses or complications related to the initial sepsis diagnosis. 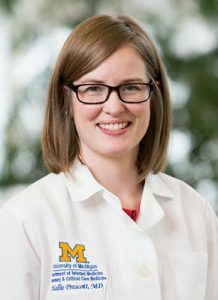 Hallie Prescott, MD, MSc, is a pulmonary and critical care medicine specialist, practicing in ICUs at the University of Michigan and the Ann Arbor Veterans Affairs hospitals. She is also an assistant professor at the University of Michigan and a member of the Sepsis Alliance Advisory Board. Dr. Prescott has been researching sepsis readmissions for the past several years and she recently answered some questions related to sepsis readmissions. Sepsis Alliance (SA): What drew you to researching post-sepsis issues? Dr. Prescott (HP): Most research, quality improvement programs, and medical school education focus on the initial 24 hours of sepsis management. Post-sepsis issues have been traditionally more of a neglected area. But, we have 14 million people surviving sepsis hospitalization around the world each year. And as we improve acute survival, we need to expand our focus and think about treatment in the later phases of hospitalization, hospital discharge, and what happens to people after they leave the hospital. SA: When you first began researching sepsis survival and readmissions, was there anything that surprised you? HP: Yes. When I started looking at this topic, we were only able to identify one conference abstract, and not a single published study on readmissions after sepsis. That was in 2014. That was the most surprising. There was nothing. So, then we looked at readmissions after pneumonia and just have this little one-liner in our 2014 paper on pneumonia readmissions saying that in initial searches, we also looked for post-sepsis readmissions but there’s nothing there. (5) I think that’s largely because readmissions have been studied in the context of performance measurement, and the Center for Medicare and Medicaid Services’ Hospital Readmission Reductions Program focuses on readmissions after pneumonia, heart failure, and acute myocardial infarction (heart attacks). My interest has really been much less in the performance measurement aspects, but more about if we could figure out what’s bringing people back to the hospital, we might be able to anticipate and reduce some of these readmissions. The things that initially jumped out, by far, were that the most common reasons for readmission are infections. Other things jumped out too. Acute kidney injury another very common reason for readmission. That wasn’t something that I necessarily suspected, but it makes sense. SA: So, what can we say to sepsis survivors and their families to either reassure them or warn them about the readmission possibility? HP: The more patients can be their own advocates, the better. It is important to be aware that recurrent infection and recurrent sepsis is a problem. We know that awareness of sepsis among the general population isn’t great. Even among people who had sepsis who are at risk for having this condition again, they aren’t always aware they had sepsis. In some situations, facilities have called sepsis survivors by phone to ask about their experience, and a large number of people in these studies will say, “What sepsis hospitalization?” This suggests that we’re not doing a great job of telling people why they were in the hospital or that they’re at risk for recurrent infection. Right now, awareness of the term “sepsis” is increasing. People are vaguely aware of it, but when people develop signs and symptoms of infection, even if they’re developing additional signs of confusion or decreased urine output, things suggesting that they’re having organ dysfunction, a lot of people’s knee jerk reaction is “Oh, I just need to get some rest and sleep this off.” People in first three months after sepsis, we know, are at heightened risk for having another episode and they should say, “Oh, I’m having symptoms of an infection that may be progressing to sepsis. I should get in to see my doctor or go to urgent care or go to the ER.” They should be evaluated and we should have a heightened threshold to really thoroughly evaluate for recurrent infection in patients. SA: But there are other reasons why someone may be readmitted to the hospital after a sepsis hospitalization, right? HP: We have a lot of data showing that medications are commonly changed when someone is hospitalized, in particular for a critical illness. We often see that if these medications aren’t restarted by the time the patient leaves the ICU, they may be forgotten, not restarted at hospital discharge or even at outpatient follow-up. They just fall off the list indefinitely. I think there needs to be greater attention to what is temporarily on hold versus what’s permanently stopped. Patients should bring all their medications to their follow-up appointments to make sure that everyone is on the same page. It is important to understand not only the current medication list, but also what each medication is for, and which are likely to need adjustment (increased or decreased dosage) in the weeks after hospitalization. For example, someone who received a lot of fluid while in the hospital by IV may need help eliminating the fluid. Diuretics, medications that make you urinate, are often used. However, once the excess fluid is gone, the diuretics are likely not needed any more. If patients continue to take them, this can cause other problems. I think there are still subtle changes in volume, fluid status, kidney function, heart function as your body is recovering so medications should be monitored closely. SA: What would you like to say to people who have loved ones in the hospital for sepsis or for survivors? HP: Prepare for your discharge. I know a lot of times at the end of hospitalization, you just want to get the heck out of there. Someone comes in to give your discharge paperwork. It’s a lot of overwhelming information. Just like you’re encouraged to write down questions before a doctor’s appointment so you don’t forget what you want to ask, we should do the same for discharge. You want to get all your questions answered. One of the biggest questions that I think patients really need answered is, who is responsible from this time when you leave the hospital until your first follow-up appointment? Even if you have an appointment booked with your family doctor, problems may arise between the discharge and your first appointment. You want to know who you can get in touch with. A lot of times, at the hospital, they’ll have a discharge coordinator and they’ll have a telephone number. But that information is not always forthcoming unless people ask for it. If you call your primary care doctor and they haven’t gotten the discharge summary yet, they’re operating blind and not exactly sure what to say. It puts them in a challenging situation as well. Sepsis readmissions are a burden to patients and their families, but they are also a burden financially. The mean (average) cost of each readmission after sepsis is $16,852, resulting in an annual cost of more than $3.5 million in the United States alone. (2) So solving the problem of readmissions not only benefits the patients, but the financial bottom line for the hospitals. I-i There may be signs or a procedure that may have caused an infection. M-mental status. The patient becomes drowsy, confused, or difficult to rouse. Prescott HC, Sjoding MW, Iwashyna TJ. Diagnoses of early and late readmissions after hospitalization for pneumonia. A systematic review. Ann Am Thorac Soc. 2014 Sep;11(7):1091-100. doi: 10.1513/AnnalsATS.201404-142OC. Previous Previous post: Sonia A.